(From Telegraph) Darjeeling, June 27: All eyes are focused on the meeting between Mamata Banerjee and Bimal Gurung at Writers’ Buildings in Calcutta tomorrow as the talks are expected to pave the way for smooth elections to the Gorkhaland Territorial Administration (GTA), ushering in peace in the region after four years of agitation. The Gorkha Janmukti Morcha president’s meeting with Mamata Banerjee will happen at a time when consensus seems to be building in the hill party in favour of contesting the GTA elections. Senior Morcha leaders such as Roshan Giri and Harka Bahadur Chhetri have already brought around party functionaries and workers in the plains who were against contesting the elections. 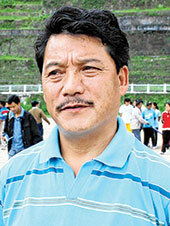 Gurung had preferred to stay away from most of the negotiations the party had held with central and state governments. The Morcha chief had last met Mamata on March 24 and tomorrow’s talks are being held at his insistence. Before leaving for Delhi, Gurung had said in Darjeeling that he wanted to “personally” hear the views of the Union ministers and the chief minister before deciding whether the Morcha should participate in the GTA elections scheduled for July 29.Chidambaram yesterday requested the Morcha to contest the polls and take its grievances before the appropriate authorities later.